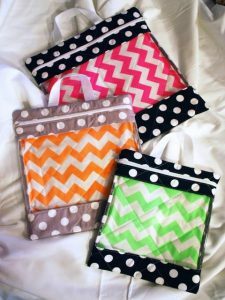 This is a project that you can finish in class, and after you have made one bag, you will want to make more for all of your projects. It is a great bag to store all of the fabrics and pieces for each project. If you are like me, you have been in the middle of a project and have misplaced one piece of fabric or the pattern or something. Using this project bag keeps everything together, even if you start it and don’t get back to it for a while. It is also a great gift for your quilting friends. This pattern comes in three sizes, so you can choose the size you want to make. All cutting will be done in class. You will need a sewing machine with a zig zag stitch.